In this section within the Plants category you will find all our products with designs and shapes of trees. To decorate patchwork or embroidery landscapes. The buttons in the shape of pines in general are very popular to place in nativity scenes with buttons, that have become very popular over the internet. The main shapes of the picture are made with fabrics, and buttons with shapes of Nativity figures, animals, stars and pines will be placed. Other types of trees can also be used. A lot of different types of sewing bags and other large projects are made in patchwork techniques, and then a large number of decorative buttons are added that complete the designs of the fabrics used. Very common elements are buttons with shape of flowers and trees. There are button packs that include assorted buttons with various Christmas designs, including Christmas trees, in different sizes, some even very tiny. A little button shaped like a Christmas tree can give a festive Christmas air to any small project that we prepare for the season, such as gift bags, Christmas cards, gift tags and more. Apart from buttons, we can also find grosgrain ribbons with Christmas tree print, very useful for packaging gifts and combine with other elements, such as buttons shaped like fir trees or pines. Other ribbons with tree prints can give a pastoral or country tone to a traditional sewing project. There might also be some metallic embellishments with the shape of a tree, mostly fir trees or pines, for Christmas decorations. Decorative button with the shape of a tree. Perfect for needlework projects or patchwork, as well as scrapbooking, card making and other crafts. Content: Price is per unit. Diameter: 38 mm approx. Material: Plastic. 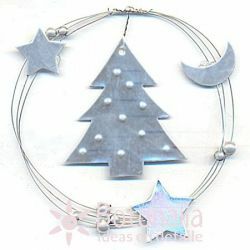 Product Description: Decorative button with the shape of a fir tree. Manufactured by DILL (Ref: 330543). To be used in scrapbooking, card making, crafts, patchwork and general sewing projects.Length: approx. 25 mm.Content: Price is per unit.Material: Plastic. Decorative plastic buttons with the shape of a tree and birds. Perfect for crafts and projects of scrapbooking, cardmaking, patchwork, etc.Content: 7 buttons (4 trees and 3 birds).Diameter: 15 to 33 mm approx.Material: Plastic. Decorative button, with two holes, with the shape of a fir tree. Perfect for needlework projects or patchwork, as well as scrapbooking, card making and other crafts.Diameter: 40 mm approx.Content: Price is per unit.Material: Plastic. Decorative button with the shape of a Christmas tree in green. Perfect for needlework projects or patchwork, as well as scrapbooking, card making and other crafts. Content: Price is per unit. Diameter: approx. 42 mm. Material: Plastic. 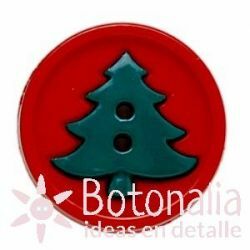 Product Description: Classic round button with a fir tree in green over a background in red. Perfect for crafts and needlework projects. Content: The price shown is per unit. Diameter: 27,5 mm. Material: Plastic. Product Description: Decorative button with the shape of a fir tree. To be used in scrapbooking, card making, crafts, patchwork and general sewing projects.Content: 1 button.Diameter: approx. 18 mm.Material: Plastic. Iron-on sticker (patch) with an embroidery of a Christmas tree with ribbon in blue and a golden star over a background in white and with thread in golden color. Dimensions: approx. 55 x 72 mm Content: 1 iron-on sticker. Material: Textile.